Be the first to share your favorite memory, photo or story of Coralee. This memorial page is dedicated for family, friends and future generations to celebrate the life of their loved one. Coralee Nelson, age 81, of Council Bluffs, passed away February 7, 2019 at Jennie Edmundson Hospital. Cora was born December 13, 1937 in Omaha to the late Millard and Crystal (Coburn) Green, Sr. She married Simmon J. Nelson on April 15, 1955. They were blessed with three daughters, Kathleen, Colleen, and Kristeen. Cora worked as an assembler for SMV Industries for the past 50 years. In addition to her parents, Cora was preceded in death by her husband, Simmon J. Nelson on June 8, 1994; infant sister, Mildred; infant brother, Richard; sister, Sabra Tilton; brother, Clifford Green and son-in-law, Jonathan Fisher. 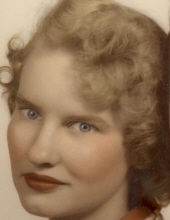 Cora is survived by her daughters, Kathleen (Edward) Finnell of Council Bluffs, Colleen Fisher of Missouri Valley, Kristeen (Brian) Forbes of Glenwood; 6 grandchildren, Ryan, Jonathan “Jake”, Kara, Alec, Daniel and Olivia; 5 great-grandchildren; sisters, Joy (Paul) Plumb-Lambert of Honey Grove, Texas, Linda (Don, M.D.) Doyle of The Villages, Florida; brothers, Ross (Irene) Green of Farragut, Iowa, Millard (Karen) Green, Jr.; special friend, Bev Voss all of Council Bluffs; many nieces and nephews. To send flowers or a remembrance gift to the family of Coralee Nelson, please visit our Tribute Store. Luncheon at New Horizon Presbyterian Church following interment. "Email Address" would like to share the life celebration of Coralee Nelson. Click on the "link" to go to share a favorite memory or leave a condolence message for the family.